Reporter Eileen Buckley talks to Karen Wielinski, who lost her husband, Doug, when a plane crashed into their Clarence Center home. 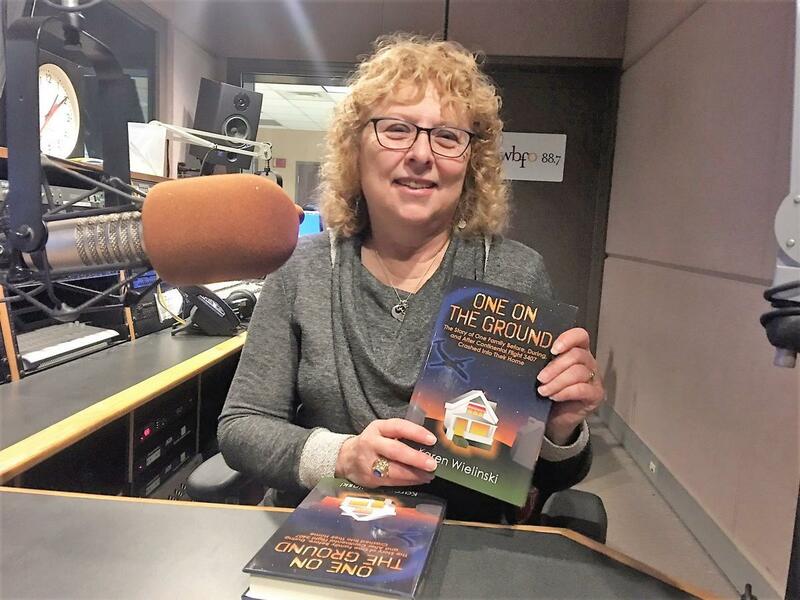 Karen Wielinski, author of "One on the Ground," shows her book in the WBFO studio. Wielinski's husband, Doug, died when Flight 3407 crashed into their Clarence Center home 10 years ago. Ten years ago, Colgan Air Flight 3407 crashed in Clarence Center, killing 50 people. The Continental Connection flight was heading to the Buffalo Niagara International Airport when the pilots of the Bombardier Dash-8 aircraft failed to recover from a stall and the plane plunged into a home on Long Street. All 49 people on board and one person inside the house were killed. Inside the home, Karen Wielinski and her daughter, Jill, managed to escape. But Karen’s husband, Doug, died in the fiery crash. This week, Wielinski recalled those dreadful moments. “You know, I think I really wondered if I had died, too – I mean, I wasn’t even sure I was still alive,” said Wielinski, who now lives in East Aurora. She remembered watching a news report and hearing “one on the ground” was killed. That phrase inspired Wielinski to write a book about the tragedy. Some proceeds from her book, “One on the Ground,” go to a Flight 3407 scholarship.